Happy Hump Day, friends! Short weeks are THE BEST. 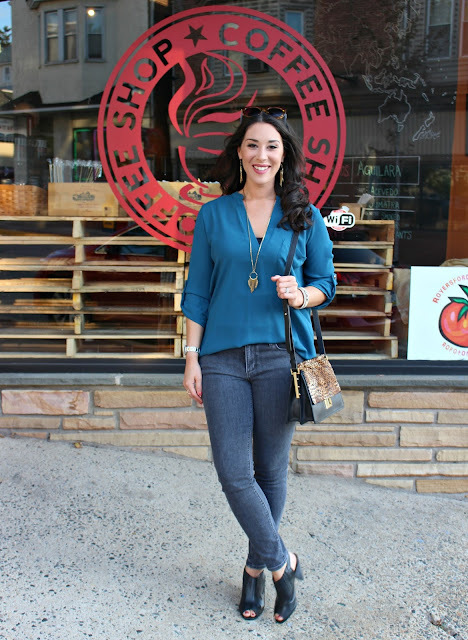 Today I'm sharing an early fall outfit featuring my favorite tunic. 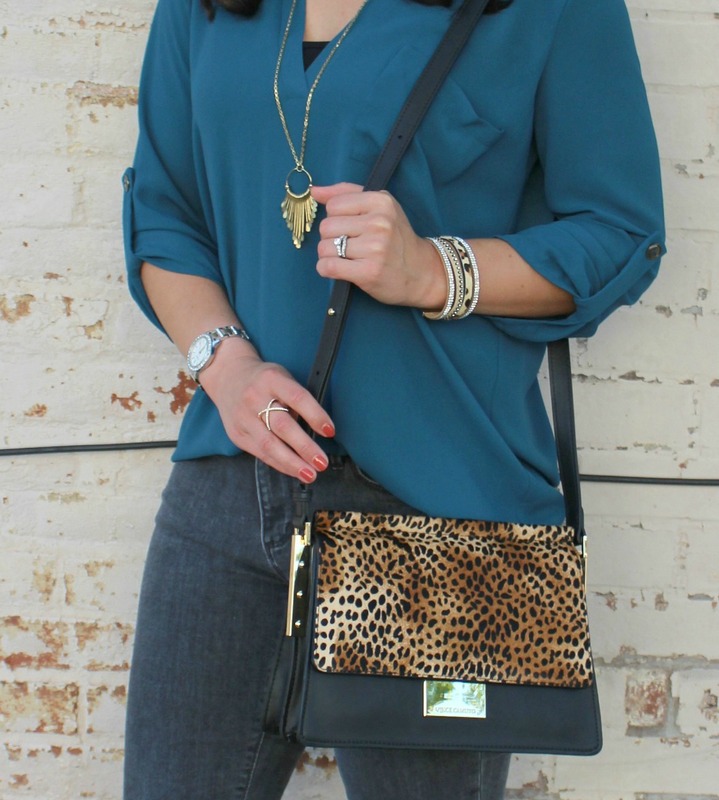 The Lush 'Perfect' Roll Tab Sleeve Tunic is so versatile and on sale for $27.90. 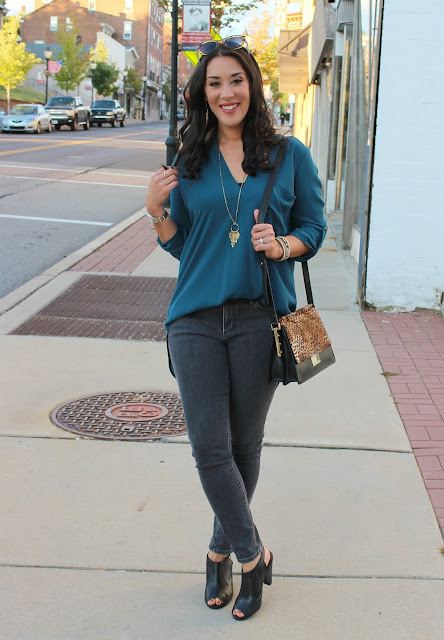 I get so much wear out of this teal top! It comes in 5 colors (I love the burnt henna for fall) and all sizes are available right now. For reference, I'm wearing a size small. For today's look, I styled this tunic with gray skinny jeans. The teal/gray combo is edgy and unexpected. This tunic is the perfect length to wear over leggings, too. Last winter I wore it with black leggings and my Ivanka Trump black over the knee boots. These OTK boots are very similar to mine. For similar gray skinny jeans, I love these at Nordstrom and these at H&M (only $19.99!). This gorgeous Vince Camuto leopard shoulder bag is my new favorite! I had my eye on it during the Nordstrom Anniversary Sale but didn't end up getting it. Last week, it went on sale for 50% off and I finally snagged it! Of course, it sold out quickly, but I'm hoping they restock it soon. 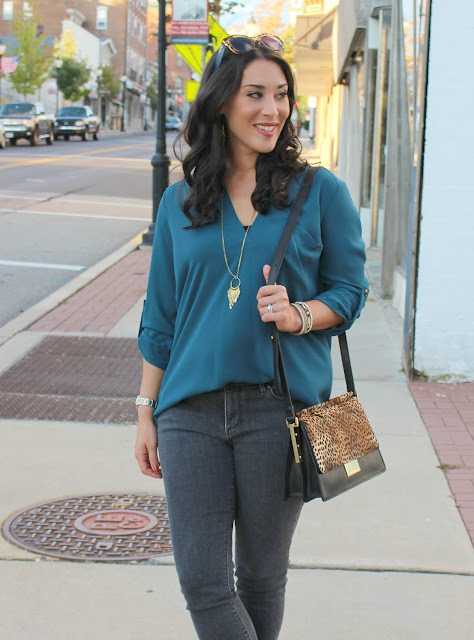 For a similar bag, I'm loving this Sole Society crossbody bag! I'm super excited to share this beautiful wrap bracelet with you all. I'm collaborating with an awesome jewelry company called Boho Betty. They have the most unique bracelet designs! I created a collection of my favorite Boho Betty bracelets for you to shop. Click here to check it out and use code STYLEINHARMONY for 20% off your order. FYI, the bracelet I'm wearing just sold out but they are restocking it shortly. The Puma Faux Suede Wrap Bracelet is identical, just in gray instead of tan. Thanks so much for stopping by! 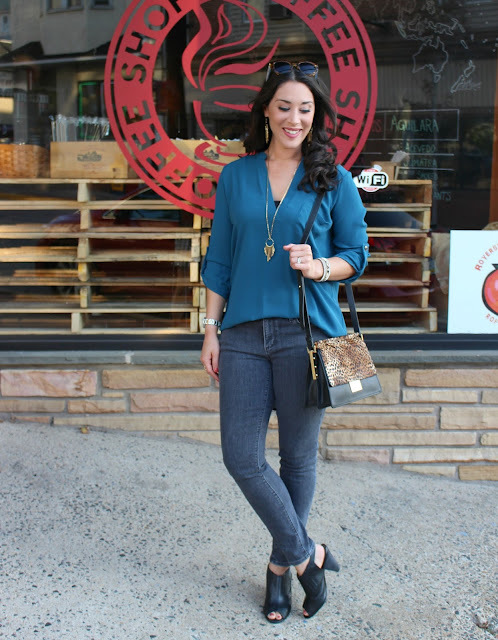 Be sure to check out my Boho Betty collection and use STYLEINHARMONY for 20% off your purchase! Really pretty look! Love the color of your top! Love the whole look! That bag is gorgeous! The tab sleeve shirts from Nordstrom get me every time!! Thanks, Vicki! The bag is AMAZING. And I agree, these Lush tunics are the best. Beautiful look! 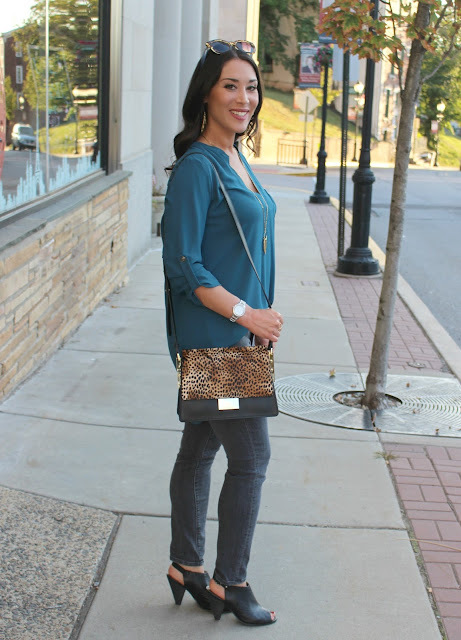 Your tunic is such a lovely color and I love your bag! 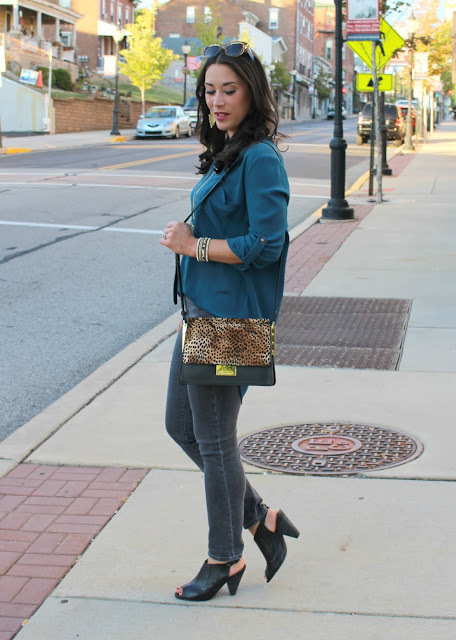 I love the rich teal color of your top! It is super flattering. Really great outfit. And that bag is fabulous! I am also loving the new Fall line of Boho Betty bracelets. 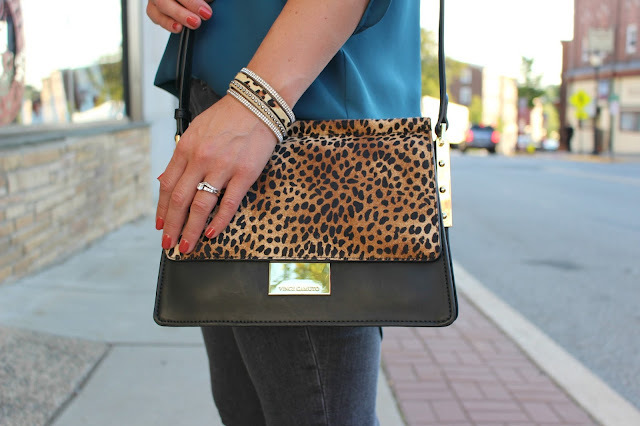 The animal print wrap bracelets are my current favorite, too!